Both species of this family found in the Pacific Northwest are of European origin. 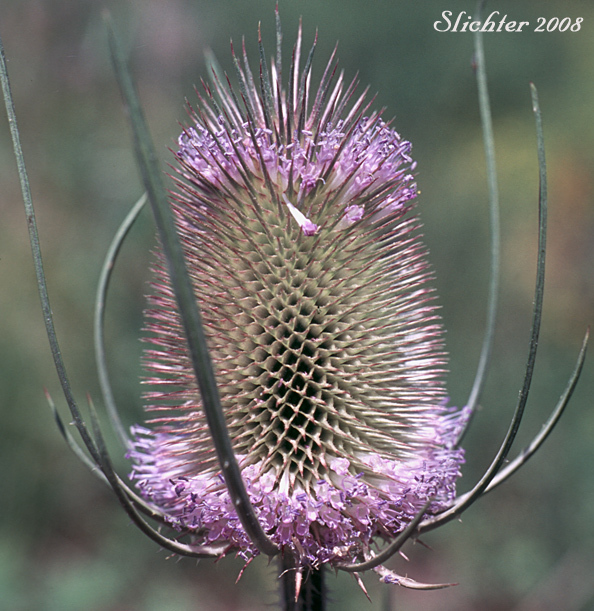 Both spread fairly easily by seed, but teasel is much more common. Knautia likewise could become established in moister, disturbed areas east of the Cascades. It is commonly sold at nurseries. Common Teasel, Fuller's Teasel, Teasel, Wild Teasel: Dipsacus fullonum (Synonyms: Dipsacus fullonum ssp. fullonum, Dipsacus fullonum ssp. sylvestris, Dipsacus sylvestris) - Biennial. Flowers irregular with 4 corolla lobes and 4 stamens. Flowers in elongated heads 6 or more centimeters long. Stems and bracts prickly. Bluebuttons, Field Scabiosa, Knautia: Knautia arvensis (Synonym: Scabiosa arvensis) - Perennial. Corollas irregular with 4 corolla lobes and 4 stamens. Flowers in compact heads 1-2 cm high and more than 2 cm wide. Stems not prickly.